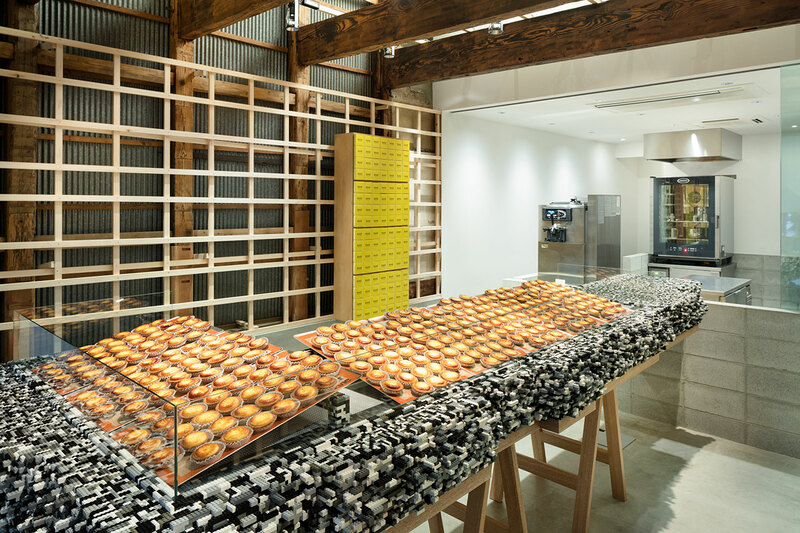 Modern innovation and time-tested tradition are the two main ingredients that have been blended into the design of the new BAKE Cheese Tart store designed by Japanese designer, Yusuke Seki. 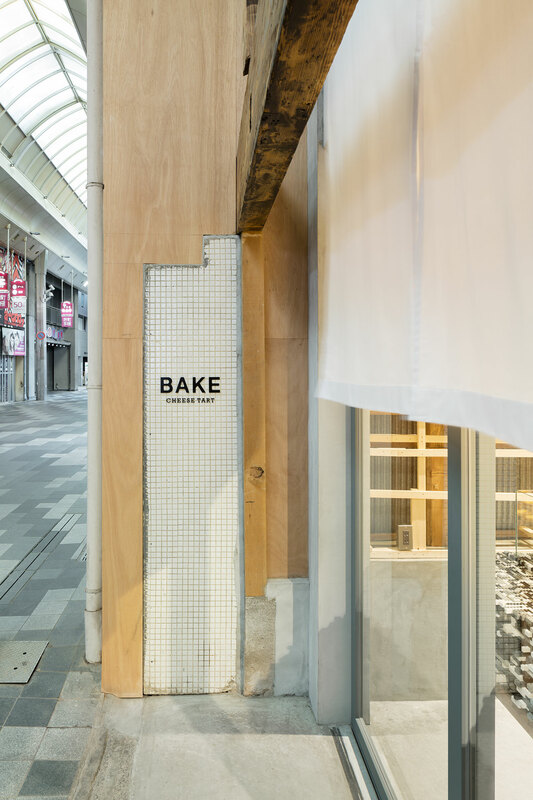 Located in one of Kyoto’s popular shopping districts, this is the latest storefront for the confectionary company which has based its delicious "freshly baked" wares on the dairy farming traditions of the Japanese island of Hokkaido. The full, mouthwatering aroma of the cheese tarts baking in the open kitchen, or on display on the counters, could come as a contrast to the straightforward clean lines and minimal detailing of the shop's décor. That is, until one pauses to cast a careful second glance at their surroundings. 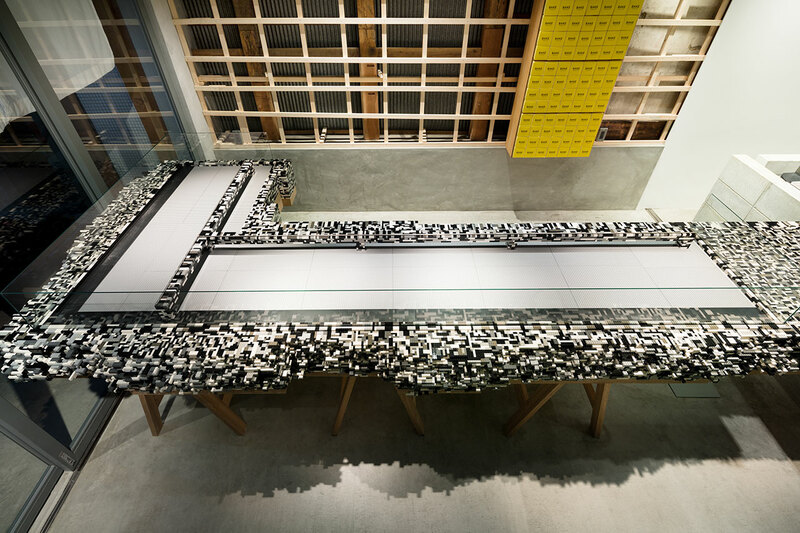 That's when patrons will notice that the black, gray and white counter, resting on a simple wood and cement base, is actually inventively constructed out of millions of Lego blocks - those remnants of childhood imagination recognizable the world over. 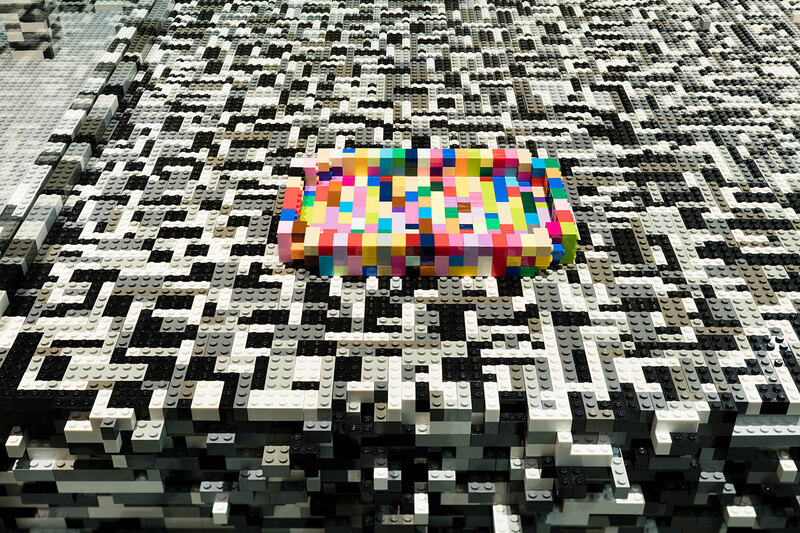 These Legos bring a sense of familiarity to the premises, no matter where in the world a patron hails from, and forges a special connection between them and the shop, even if it’s their first visit. 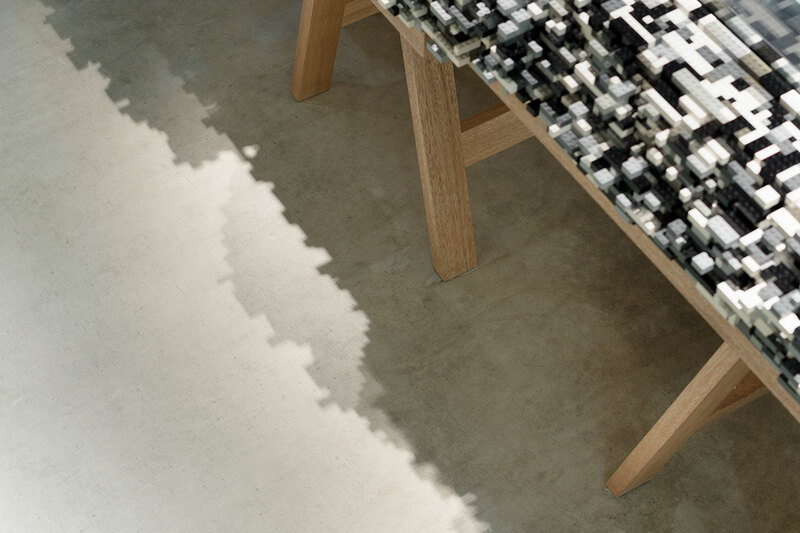 The black, gray and white counter, resting on a simple wood and cement base, is actually constructed out of millions of Lego blocks. 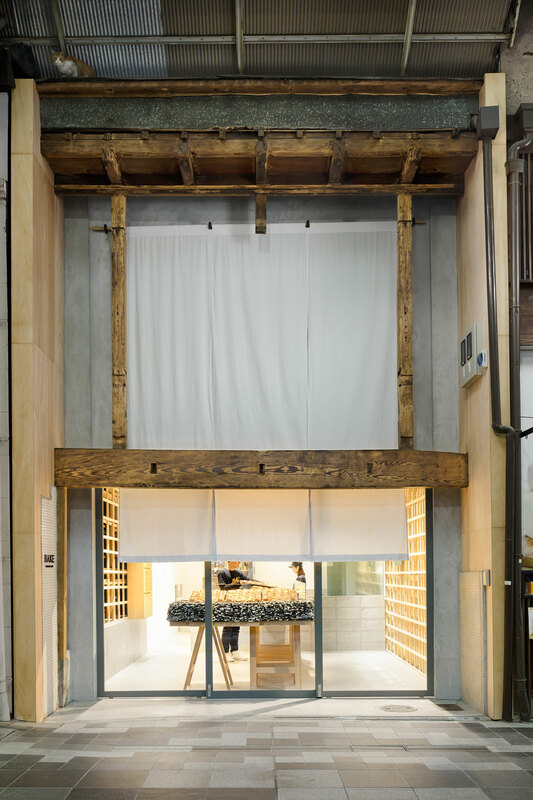 This brilliant feature is meticulously merged with the stunning, wood lattice walls constructed in the traditional "Shitaji-Mado" framework technique, a method that has traditionally been associated with Japanese teahouses. 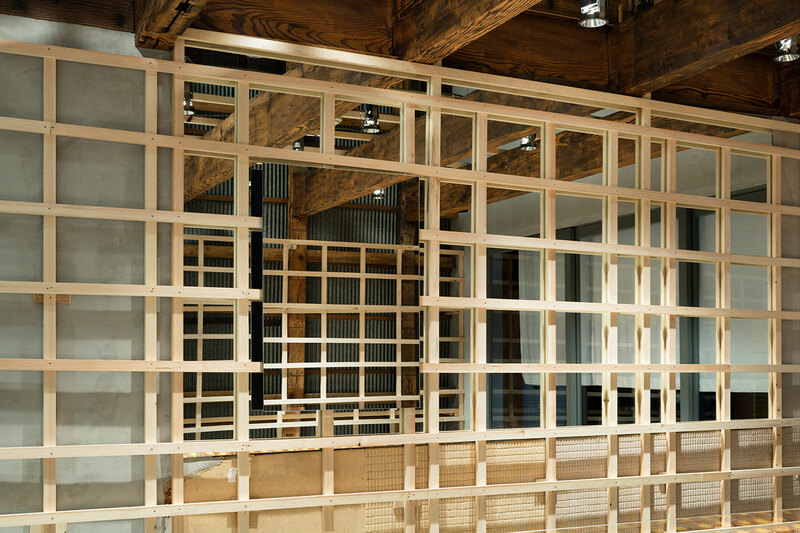 To note, each region of Japan has differing specifications and since these walls have been made to the exact specifications of this particular region they bring with them a strong sense of the country's vast design history. 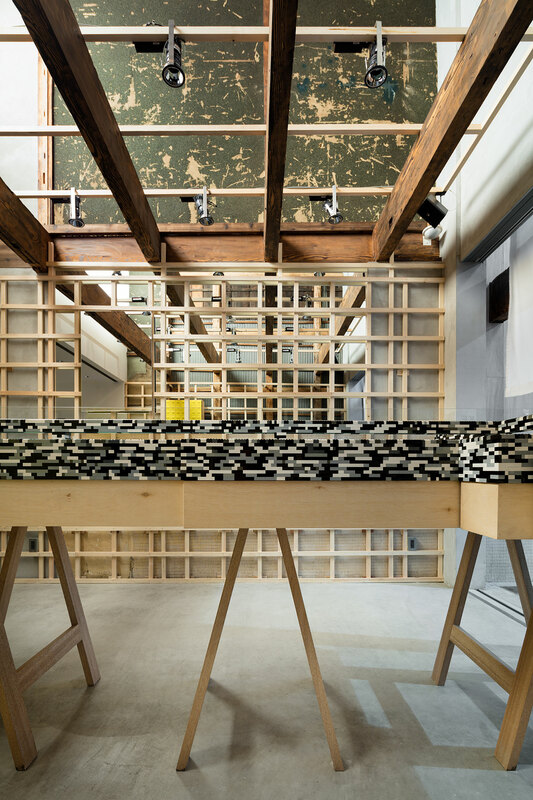 These lattices in particular play peek-a-boo with the existing wall cladding of the shop, as if a silent reminder at how well old and new can interplay if both are viewed with respect and referenced with originality. Other than these two main design attractions, patrons will also notice special touches that Yusuke Seki has planted throughout the premises. 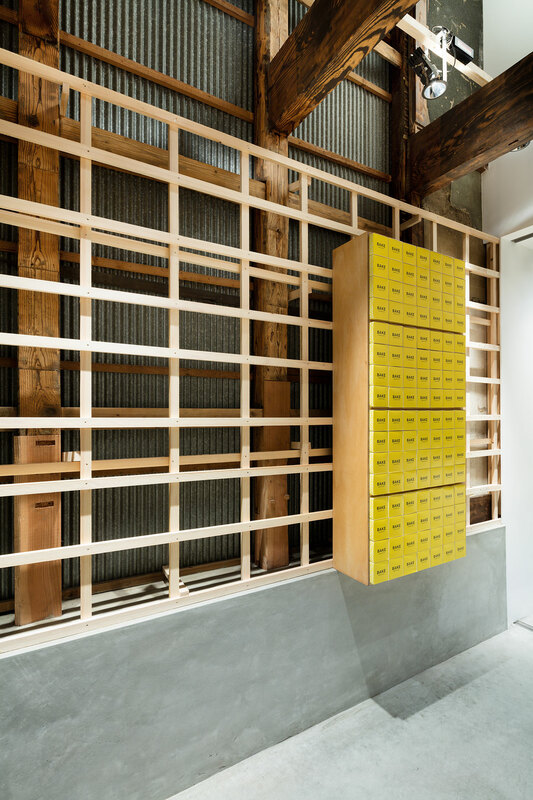 These include the bright, multicolored Lego "tray" displayed amidst the black-gray-white Lego counter; the shelf filled with yellow cube, takeaway boxes; and the hefty, dark wood beams racing across the ceiling and down the walls, literally framing the store. Then of course there are the bakers who are hard at work in the kitchen behind the large glass wall, preparing the main attraction: the delectable, cheese mousse-filled, crispy-crusted tarts, the aromas of which draw patrons inside in the first place. If food is truly a universal language, then what makes it so truly and collectively enticing are its regional differences and unique twists on familiar comforting elements. After all, who doesn't love a cheese tart, and what better place to savor BAKE's version than in such a thoroughly modern and yet ultimately traditional setting that perfectly exemplifies its multilayered regional and international flavors.